Laboratory for Machine Tools and Production Engineering (WZL), RWTH Aachen University, Aachen, Germany. Received October 2nd, 2009; revised November 15th, 2009; accepted December 24th, 2009.
existing range of products by offering customer-specific services within so-called industrial product-service-systems. However, the lack of local presence inhibits the toolmakers’ abilities to deliver these services to their global customers. are presented in this paper. ns put pressure on small- and medium-sized toolmakers. value-adding chain can be provided by the toolmaker. engthening the competitive position of the latter. IPS2 on a global level is given. ong the tool’s entire life-cycle. vide services on a global le vel ? each of the four dimensions are elaborated. of markets more consequently for selling their tools. to-seven scale, seven being the most severe disadvantage. deliver services on a global level. the customer’s production site in rare cases. percent of the maintenance with their own capacities. have trouble finding appropriate partners. 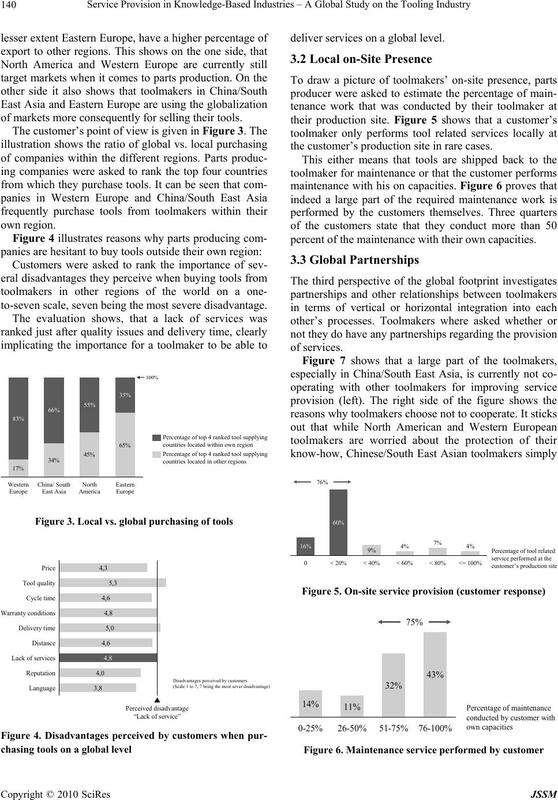 tages they perceive when sourcing globally (Figure 9). 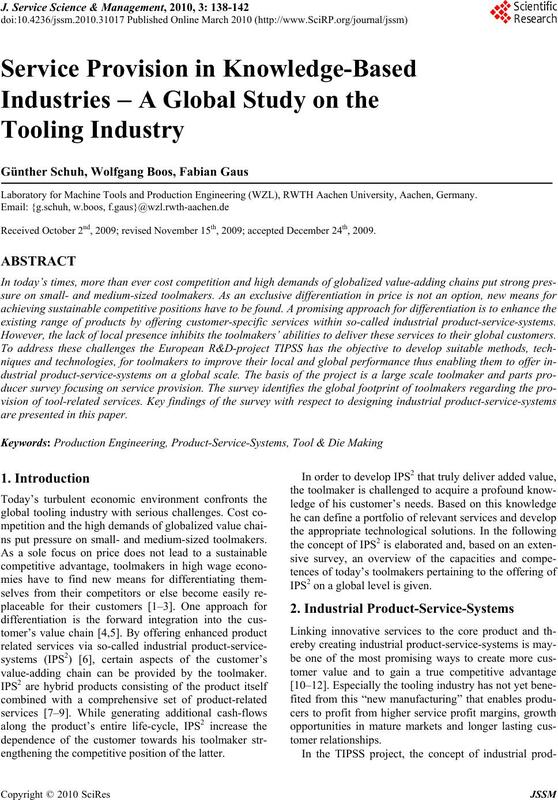 are being adequately addressed by toolmakers in general. the vast competition of the globalized markets. vey can be fo und on the p roject’s website (www.tipss-fp 7.eu). ers,” The McKinsey Quarterly, Vol. 2, pp. 14–16, 2004.
able Manufacturing Businesses, Springer, London, pp. 10th edition,” Cengage Learning, Mason, 2008. Life Cycle Engineering, pp. 211–220, 2001.
numbers,” Management Accounting Quarterly, Vol. 5, No. Industrial Ecology, Vol. 4, No. 1, pp. 1–2, 2000.
service business development,” In B. Hefley, and W.
neering, Springer, New York, pp. 41–48, 2007.
tem,” Journal of Cleaner Production, Vol. 10, No. 3, pp. 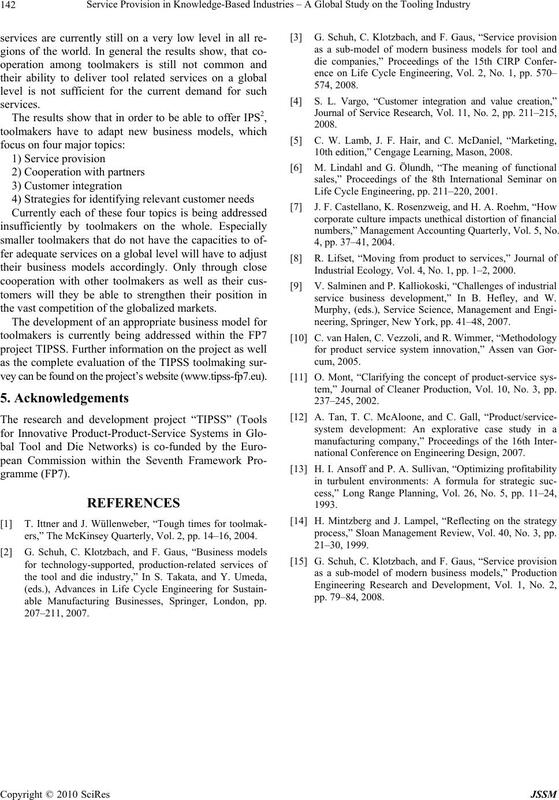 national Conference on Engineering Design, 2007.
process,” Sloan Management Review, Vol. 40, No. 3, pp.